The recently released Lamborghini Huracan LP610-4 will very soon be a cruiser for a lucky police officer in Italian State Police. The highly gorgeous model dressed especially for the cops from the house of Lamborghini will cost around $240,000 to maintain peace and security in State and will be replacing the Gallardo which was used for period of 4 years, starting from 2004 to 2008. 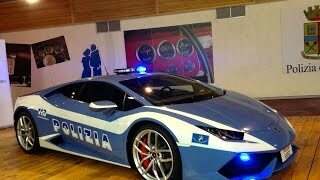 Let us have a look at the review of Lamborghini Huracan LP610-4 Polizia 2015 to know more about it. The interior of Lamborghini Huracan LP610-4 Polizia 2015 gets more advancement when compared to its civilian sibling. Here by advancement we mean the technological ones. These innovations will help the cops in swiftly documenting the evidences. The first in queue is Proof Video Data System, once enabled this system with help of GPS data will calculate the location, direction and the speed it is rolling upon and with help of this the machine will feature the estimate speed of the vehicle being chased. You’ll also have a radio data transmission mechanism that will enable and portray the real images to the relevant police station and thus solving the time wasted upon documentation. With its videos and automatically number plate retrieval cops will be able to easily trace the identification of stolen vehicles. Exterior of Lamborghini Huracan LP610-4 Polizia 2015 is high-tech example of safety and quality. With its chassis build from aluminum and carbon-fiber cops will be able to maintain stability even at higher speeds and thus the chasing action will be safe and quick. Its outer body comes drenched in blue with encrypted ‘blu Polizia over it, which makes it distinct from its sibling. Apart from this the regular exterior details remain same and making only difference through its flat signal lighting and blue LEDS that ensure the signal doesn’t gets missed in any way. 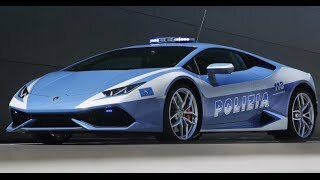 Being a police car, you’ll have lighting mounted over roof while Lamborghini Huracan LP610-4 Polizia 2015 is also equipped with four other sirens that are integrated in front and rear to make the warning signal audible enough to the extent of clarity and loudness. Beneath the hood of Lamborghini Huracan LP610-4 Polizia 2015 is mounted a 5.2 Liter V10 engine generating total output of 610 hp and peak torque of 560 nm paired to a seven-speed dual clutch transmission. 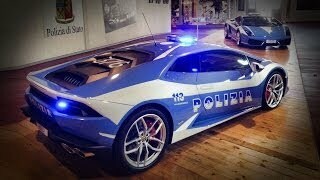 The top speed of Lamborghini Huracan LP610-4 Polizia 2015 crossed 202 mph and can easily sprint to 62mph from standstill in just 3.2 seconds.